Roughly ten months in, how is it not presumptuous for anyone—especially a conservative—to proclaim in print that Donald Trump is “no Reagan”? Perhaps Washington Times columnist Robert W. Merry should wait another three years before making any sweeping pronouncements? What’s Mr. Merry’s basis for this flawed, and premature, conclusion? The failure of the entrenched Republican Congress to repeal and replace Obamacare. After seven years of the establishment’s broken promises, that’s the fault of Mitch “expectations are too high” McConnell, Paul “not ready” Ryan and the logjam created by anti-Trump Republicans (read: John McCain and the Washington swamp). For starters, Mr. Merry needs a refresher course in civics 101. Specifically, only Congress has the authority to make (or unmake) law. That’s the separation of powers, which means the legislative branch is autonomous to any U.S. president’s desires (like campaign pledges). Hence, Mr. Merry’s claim, “The Donald is failing to win over the public with bold and clear political messages” is pure hogwash. What of his Reaganesque “Make America Great Again,” and “America First” slogans? For the record, Mr. Trump is vigorously accomplishing those aims: with renegotiated trade deals favorable to the U.S.; his exit from the job-killing Paris climate accord; illegal border crossings plummeting by 76% (as reported by the Washington Times); and future changes to tax policy to promote domestic job growth. In every case, Mr. Trump’s message remains unambiguous and crystal clear. So, too, are his actions. Put a new GOP health-care bill on his desk guarantees his signature. Indeed, the president has been chopping at the bit since January 20! Why, then, does Mr. Merry write, “The fault lies primarily with the president”? That’s a simpleton’s answer by someone obviously afflicted with “Trump Derangement Syndrome”. Unfortunately, Republican presidents habitually get chastised for events beyond their control. For instance, despite successful federal efforts to provide relief to hurricane ravished Puerto Rico, mayor Carmen Yulín Cruz outrageously criticizes the president for her failure to distribute boated in supplies! With her city in ruins, what else is an incompetent local Democrat to do than pass the buck? Thus, for face-saving distraction—and the bonus of an anti-Trump narrative—the hard left MSM is happy to advocate propaganda as fact. That’s echoed by Robert Merry’s overtly cynical column. Still, as he’s determined to blame a president for Obamacare, why not its namesake: Barack Obama? To that end, why not hold the responsibility-phobic Democratic Party accountable for their 2010 takeover of 1/6 of the U.S. economy: with zero Republican support. That’s the unmentioned context for the dysfunctional polarization Mr. Merry blithely glosses over. Its reality predates Mr. Trump’s emergence on the political scene by years (if not decades). Therefore, how is it fair to blame someone for a systemic problem that’s inherited? In truth, the Republican establishment bears equal responsibility with intransigent Democrats. Both groups populate Congress, not the White House. Specifically, per Reuters, the GOP’s roughly 60 unsuccessful attempts to repeal or alter Obamacare so far. The fact remains that Republicans have held control of both houses since January 3, 2015. Therefore, their repeated failures to change this law is not President Trump’s fault. Like Mr. Reagan, he must work within the framework of the Constitution—and the inert personalities of career politicians more interested in playing politics than getting positive results for the American people. Ultimately, the underlying conflict unrecognized by Mr. Merry is one of style over substance. One suspects he would be content with a soft-spoken RINO (Republican In Name Only) like Mitt Romney or a go along to get along establishment figure like Jeb Bush. Or perhaps a fresh-faced dreamer parroting idealistic platitudes designed to pacify the most sensitive among us, but accomplishing little beyond pretty PR (read: Paul Ryan). Fortunately, none of those people reside in the Oval Office. 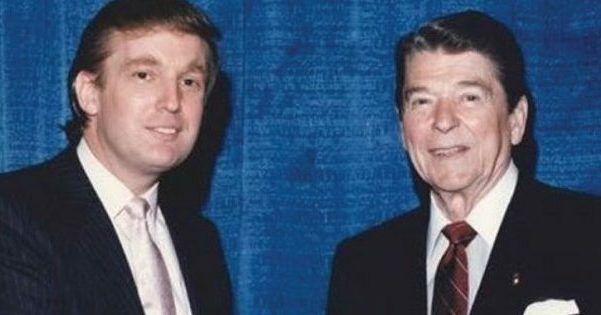 The real question here is can Donald Trump act as a 21st century Ronald Reagan while not embodying “The Great Communicator’s” particular gifts to persuade with charismatic warmth, and often pointed humor? That answer to the open minded is, of course, yes! As a case in point, the same edition of the Washington Times reported: “Banishing red tape: Trump the ‘least regulatory president’ since Reagan, study finds”. So, there’s proof that a certain old guard prognosticator can’t ignore. Any person so stuck in ways of the past cannot embrace an evolving present. For this Robert Merry should be pitied, but not heeded. To some, Donald Trump’s unconventional style—as a plain-speaking, brassy New Yorker—is disconcerting. But it’s actually a strength that will likely checkmate those who would do our nation serious harm. Our continued survival is frankly aided by the new paradigm of his unpredictability. What’s needed now is this deal making brawler to be his own man, as Reagan was. Not another polished, weak-kneed elitist offering a failed past as prologue.